If you want to organize your messages in Outlook on the web, you can create new folders or rename, move, or delete existing folders. You can also set up rules so that Outlook on the web automatically moves messages into folders depending on conditions that you specify. Junk Email Messages that have junk email characteristics but that aren’t blocked by a spam filter before they reach your mailbox will automatically be moved to this folder. Learn more about how to Filter junk email and spam in Outlook on the web. In Outlook on the web, the Favorites folder automatically includes these folders: Inbox, Sent Items, and Deleted Items. You can add folders to Favorites to make it easier to keep track of the folders that are most important to you. Adding a folder to Favorites doesn’t move the folder, but instead creates a link to it. Folders added to Favorites are still in your personal folder. To add a folder to Favorites, right-click the folder under your personal folder, and select Add to Favorites. To reorganize folders in Favorites, choose a folder and drag it to a new position in the folder hierarchy. Or right-click a folder and then select Move up in list or Move down in list. 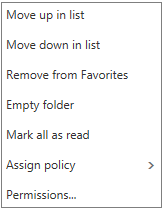 To remove a folder, right-click the folder you want to remove from Favorites and select Remove from Favorites. This action only removes the link to the folder; the folder is still in your personal folder. 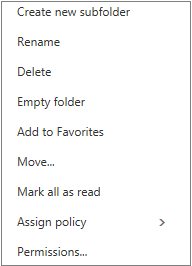 Depending on your organization's policies, you may be able to add a public folder to Favorites. For information about how to create a public folder in Outlook on the web and add it to your Favorites, see Create and share a public folder. Note: Policies are controlled by your organization’s administrator. Policies may not be available for your account. Archive and retention policies let you automatically move or delete messages after they’ve been in your mailbox for a certain amount of time. To learn more about these policies and how to assign them, see Assign retention labels and archive policies in Outlook on the web. When you delete a message or folder, it’s moved to the Deleted Items folder. 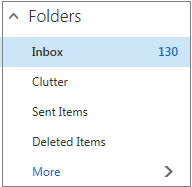 You can either manually remove messages from the folder or you can set Outlook on the web to automatically empty your Deleted Items folder when you sign out. At the top of the screen, click Settings > View all Outlook settings. To learn how to restore deleted messages, see Recover deleted email messages in Outlook on the web. 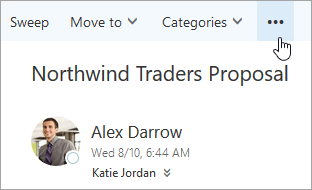 Use commands on the Outlook on the web command bar or set up rules to have Outlook on the web automatically move messages into folders as you receive them. Commands like Sweep and Move to let you automatically delete or move messages from a particular sender. Commands appear on the Outlook on the web command bar when you select a message in your inbox. Clutter Helps you filter mail based on how you handled incoming messages in the past. When turned on, the email server keeps track of messages you read or don't read. Messages you don't read are moved to the Clutter folder. Junk Email Messages that have junk email characteristics but that aren’t blocked by a spam filter before they reach your mailbox will automatically be moved to this folder. The Learn about junk email and phishing article has more information about your Junk Email folder. Notes This is a read-only folder. You must use Outlook to create or edit items in this folder. Conversation History By default, a copy of every conversation you have in Skype for Business is put in your Conversation History folder. Most of what you can do with a folder can be found in the shortcut (context) menu that appears when you choose a folder and right-click. Which shortcut appears depends on if you've selected a folder under Favorites or under your personal folder. The Favorites folder shows the top mail folders. The shortcut menu features options that are used or needed most often when working with these folders. Move up in list or Move down in list Use one of these options to reposition the folder higher or lower in the folder hierarchy. Remove from Favorites Removes the folder from Favorites. Removing the folder from Favorites doesn't remove it from your personal folder. Empty folder Deletes everything in the folder, including any subfolders. Mark all as read Marks every item in the folder as read. Assign policy Assign an archive or retention policy to messages in the folder. This option may not be available if your administrator has not enabled it. Permissions Give other users access to folders in your mailbox. Your personal folder is a collection of all the mail folders available to you. The shortcut (context) menu attached to your personal folders offers more options than the shortcut menu with the Favorites folder. Not all options, however, are available for all folders, and some options might not be available because of administrative permissions. Create new folder Use to create a new subfolder in the folder you right-clicked. Add to Favorites Adds (links) the current folder to your Favorites. Next to Favorites or the name of your personal folder, click the Create New Folder button. .
Right-click your personal folder and then select Create new folder. Any new folder created will automatically appear below the default folders. Any new folder created in the Favorites folder will automatically be added to your personal folder, but it can only be deleted from the personal folder. Any new folder created in your personal folder, however, will only appear in the Favorites folder if you right-click it and choose Add to favorites. In your personal folder, right-click the folder that you want to add a subfolder to, and select Create new subfolder. In the new folder box, enter a name for the subfolder and press Enter. In your personal folder, right-click the folder you want to rename and select Rename. In your personal folder, right-click the folder you want to move, and select Move. Right-click the folder or subfolder you want to delete, and select Delete. 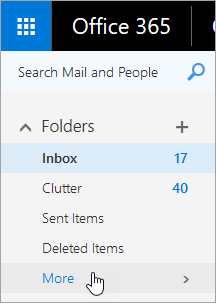 In Outlook on the web, the Favorites folder automatically includes these folders: Inbox, Clutter, Sent Items, Deleted Items. You can add folders to Favorites to make it easier to keep track of the folders that are most important to you. Adding a folder to Favorites doesn’t move the folder, but instead creates a link to it. Folders added to Favorites are still in your personal folder. To reorganize folders, choose a folder and drag it to a new position in the folder hierarchy. Or right-click a folder and then select Move up in list or Move down in list. When you delete a message, it’s moved to the Deleted Items folder. You can either manually remove messages from the folder or you can set Outlook on the web to automatically empty your Deleted Items folder when you sign out. Your administrator may also have set up a policy to empty items from your Deleted Items folder after they’ve been there for a preset number of days. At the top of the screen, click Settings . Under Your app settings, select Mail. To learn how to restore deleted messages, see Restore deleted email messages in Outlook on the web. Use commands on the Outlook on the web menu bar or set up rules to have Outlook on the web automatically move messages into folders as you receive them. Commands like Sweep and Move to let you automatically delete or move messages from a particular sender. Commands appear on the Outlook on the web menu bar when you select a message in your inbox. Sweep lets you quickly delete unwanted emails in your Inbox. When you select a message, you can automatically delete all incoming email from that sender, keep only the latest email, or delete emails older than 10 days. In your inbox, select a message to which you want to assign a rule and click on the Outlook on the web menu bar. Click Create rule. The New inbox rule dialog box (form) opens. Click OK to save the rule. Depending on the structure of your account, you might receive a warning about modifying your rules. If necessary, consult your administrator. Note: If you need to move messages out of your mailbox but want to save them, you can use Outlook to save your messages to a .pst file. The messages will be available only when you’re using Outlook and can access the .pst file. For more information, see Introduction to Outlook Data Files (.pst and .ost), and Create an Outlook Data File (.pst) to save your information.